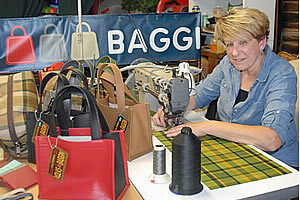 My name is Susie, owner and designer of VolksBaggin. I hand-craft VW vintage-style upholstery interiors into an exciting new life - Tote Bags, Key Fobs, Wallets and More! I bought my very first car right out of high school. It was a 1969 Volkswagen! I love the beauty and simplicity of the car! I drove a few more bugs before moving onto a bigger car. In 1998 I moved from NH to CA, landing a job at West Coast Classic Restoration, a One-Stop Shop offering restorations in all things VW. I was never really a car gal but after a few months I fell in love again with VWs. I started off helping in the office. I listened and learned all about VW upholstery interiors: the colors, the textures, and the years the fabric was used. The Idea - How VolksBaggin Started . . . I’ve been asked this question many times, and I love telling the story! It all started with a little bag . . . I carried my little bag with me wherever I went. Again, and again I heard “what a cute little bag.” “What is so cute about this bag” I thought? WHAT! And that day my “cute, little bag” became VOLKSBAGGIN, transforming our vintage-style VW upholstery interiors into an exciting new life! 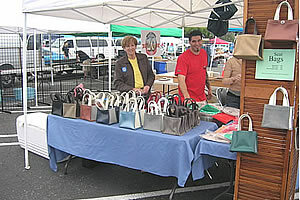 At my first showing in 2005 I brought 50 bags to sell. And I sold all 50 that day! Getting a mention in local newspapers, various VW Magazines (most recently, Hemming Sports and Exotic Cars) or a contract with VW DriveGear-Official Volkswagen Merchandise - rewards like that keep me going.